Depart Dublin for Istanbul and on to Tel Aviv airport. 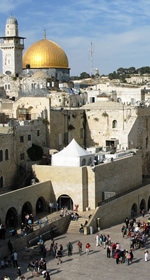 Coach to Jerusalem and check in to Holy Land Hotel in Jerusalem opposite Herod�s Gate. 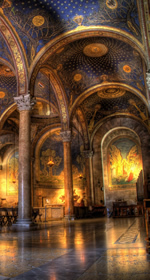 Visit Bethlehem, Basilica of the Nativity, birthplace of Jesus, Mass in Crypt. Coach to Shepherd�s Field Cave & Church where the angels sang their hymn of glory on the first Christmas night. Visit Bethany Church of Martha and Mary time permitting. Early Mass on Calvary (7 am) visit Tomb of Christ. After breakfast visit St. Anne� Church, birthplace of Mary and Pool of Bethesda. Tour of Lithostrotos in Ecce Homo, where Jesus stood before Pilate, Begin the Way of the Cross as we walk in the footsteps of Jesus along the Via Dolorosa ending in the Church of the Holy Sepulchre. Early trip to Judean Desert where we have time to experience the desert and celebrate Mass. Coach to St. Peter in Gallicantu Church. In the grounds stand on the original steps that Jesus walked up on the first Holy Thursday. Pray in the pit and experience what Christ�s prison was like on the night of his arrest. Coach to Mount Tabor in Galilee to Church of the Transfiguration where we celebrate Mass. Visit Sepphoris. Lunch in Nazareth and visit Church of St. Joseph and Church of the Annunciation. 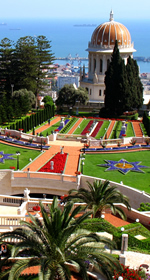 Visit Church of Beatitudes overlooking the Lake. Check into Sea of Galilee Hotel by lake. Visit Benedictine Church of the Multiplication of Loaves & Fishes. Visit Primacy of Peter Church where Jesus cooked the breakfast after the Resurrection where we celebrate Mass. Lunch. Boat trip from Gennesareth to Capernaum on the Lake of Galilee. Visit Synagogue & Church in Capernaum. Coach to Tel Aviv for return flight to Dublin via Istanbul.